WELCOME to the Oxford Township Website. Located in the southwestern part of Erie County, it borders Perkins Township to the north, Milan Township to the east, Groton Township to the west, and Ridgefield Township to the south. There are two state natural areas located within the township; the 32-acre Erie Sand Barrens State Nature Preserve in the northwest part of the township and the 296-acre Milan State Wildlife Area in the southwest part of the township. 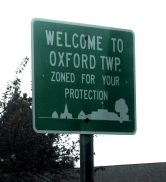 Drop off at the Oxford Township Garage.